African cassava mosaic virus (ACMV) | Infonet Biovision Home. Cassava plant showing symptoms of the African Cassava Mosaic Disease (ACMD) transmitted by whiteflies. In East Africa, African cassava mosaic virus is the most important single factor limiting cassava production. Its wide distribution in the region is primarily due to the use infected planting material, the widespread presence of the vector (Bemisia tabaci) and the use of traditional local varieties that are susceptible to the virus. During the 1990s, a pandemic of an unusually severe form of the disease expanded to cover a large part of East Africa, southern Sudan and eastern Democratic Republic of Congo. This has been associated with the occurrence of a novel and highly virulent cassava mosaic begomovirus the "Ugandan variant" of East African cassava mosaic virus (EACMV-UG). (Legg et al., 2005). African cassava mosaic virus is the most important virus disease of cassava, but total losses are extremely difficult to estimate. For example, while cassava yields are only 9 tons per hectare in ASARECA region, in India, the yields are averaged at 25 tons per hectare. Yield losses with individual cultivars have been reported from different countries to range from 20 to 95% (Seif, 1982). Losses depend on variety and crop growth stage at infection, but are usually substantial. In Cote d'Ivoire, total losses were estimated to be 0.5 million tonnes per year compared with actual production at the time of 0.8 million tonnes. Cassava (Manihot esculenta) and castor bean (Ricinus communis) are the two major hosts of African cassava mosaic virus. Wild hosts are other plants of the family Euphorbiaceae (for example wild poinsettia, garden spurge). African Cassava Mosaic Disease (ACMD). The leaves of this local cultivar of cassava are expressing severe ACMD symptoms. 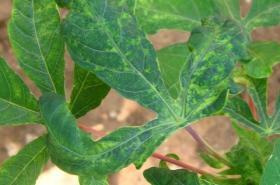 Symptoms of African cassava mosaic virus disease occur as characteristic leaf mosaic patterns that affect discrete areas and are determined at an early stage of leaf development. Leaf chlorosis may be pale yellow or nearly white with only a shade of green, or just noticeable paler than normal. The chlorotic areas are usually clearly defined and vary in size from that of a whole leaflet to small flecks or spots. Leaflets may show a uniform mosaic pattern or the mosaic pattern is localised to a few areas, which are often at the bases. Distortion, reduction in leaflet size and general stunting can be secondary effects that are associated with symptom severity. Symptoms vary from leaf to leaf, shoot to shoot and plant to plant, even of the same variety and virus strain in the same locality. Variation in symptoms may be due to differences in virus strain, plant age, and environmental factors such as soil fertility, soil moisture availability, radiation and particularly temperature. Sometimes leaves between affected ones may seem normal and give the appearance of recovery. This behaviour is influenced by the ambient temperature and host-plant resistance. However, symptoms may reoccur on recovered plants when environmental conditions again favour symptom expression. 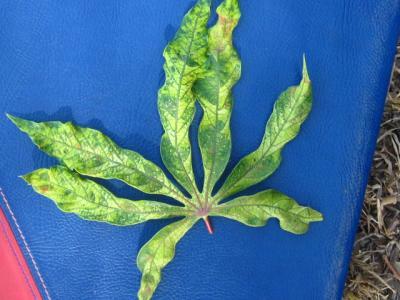 The first few leaves produced by an infected cutting sometimes do not show symptoms and are subsequently followed by severely affected leaves, but there is a tendency for symptom severity to diminish as plants age, especially in resistant varieties. Symptoms tend to reappear on the axillary growth when the shoot tips are removed. De-topping stem tops is sometimes adopted to enhance expression in screening clones for resistance. Leaves: Mosaic patterns; leaf deformation. African cassava mosaic geminivirus (CMGV) is a vector-borne virus, transmitted by the whitefly Bemisia tabaci and disseminated in cuttings derived from infected plants. Cassava is the major CMGV reservoir and possibly the main host of whitefly vectors. Whiteflies are carried by the prevailing wind and can spread the virus over distances of several kilometres from cassava fields. Even a single whitefly can transmit the virus. Whiteflies prefer to feed on young leaves. Virus spread, cassava growth and whitefly populations are dependent on climatic factors. Also, seasons of fast spread coincide with periods of rapid cassava growth and population of whiteflies carrying the virus. Crop growth in turn, depends on radiation-associated factors in humid conditions or to rain-associated ones in drier environments. Cassava varieties also differ greatly in their susceptibility to the virus (Farguett and Thresh 1994). This illustration shows the methods promoted on infonet-biovision. The methods shown at the top have a long-term effect, while methods shown at the bottom have a short-term effect. In organic farming systems, methods with a long-term effect are the basis of crop production and should be of preference. On the other hand methods with a short-term effect should be used in emergencies only. On infonet we do not promote synthethic pesticides. Further below you find concrete preventive and curative methods against African cassava mosaic virus. Roguing is a well known means of virus disease control and it is only advocated when disease incidence is low (less than 5%). 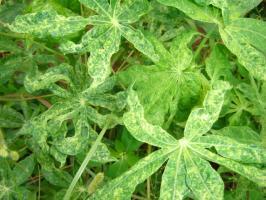 It has been often recommended to control the African cassava mosaic virus. Roguing is more effective when practiced by farmers' groups and throughout whole localities. Use cassava varieties which are resistant and/or tolerant to mosaic virus. For example varieties derived from IITA, Nigeria, such as TMS 30337, TMS 30395, TMS 30572, TMS 60142, TMS 30001 and TMS 4(2)1425) have been widely distributed in Africa and are now grown by producers in many main cassava-producing countries in Africa. If it is not possible to find cassava plants that are completely free from the disease, select cuttings from stem branches instead of the main stem. Stem cuttings from the branches are more likely to sprout into disease-free plants than stem cuttings from the main stems (James et al, 2000). Also, it has been found that growing of mixture of varieties in the same field aids in reduction of virus transmission (Legg et al, 2005). Virus incidence and whitefly numbers tend to be greatest in the outermost rows of plantings, especially the ones oriented across the prevailing wind. Plant in large, compact blocks. Elongated plots should be oriented along the prevailing wind, rather than across, so that less plants are exposed. Use the outermost rows to raise virus-free cuttings for distribution, or plant a resistant variety of cassava around the field margins. The main spread of cassava mosaic virus is into and not within plantings. Thus, you can facilitate control by selecting suitably isolated sites where the risk of infection from outside sources is limited. There is little information available on the minimum isolation distance needed for an effective infection control. The risk of infection is much higher where sources of infection are upwind and nearby than when the nearest sources are downwind and remote. Thus, spread can be decreased by planting sequentially in an upwind direction from the source. Studies in Uganda and in Ivory Coast showed that spread of cassava mosaic disease is influenced by host-plant population density and disease incidence was highest at the widest spacing between cassava stands and along footpaths or gaps in the stands. Thus, using uniform dense cassava stands rather than irregular widely spaced ones can help reduce disease incidence. You can facilitate the control of the cassava mosaic virus by avoiding exposition of vulnerable young plants to risk of infection in times when whiteflies are most abundant. Cassava grows readily from stem cuttings, enabling planting throughout much of the year, especially where there is enough rainfall. In coastal districts of Kenya, spread of cassava mosaic virus occurs during the rains from May to July; it may be an advantage planting later in the year if conditions are not so dry to influence crop growth. Cassava is able to grow in unfavourable environments. Plantings are often made in poor soils or after more nutrient-demanding crops. Studies in Uganda showed that poor soil may enhance damage caused by the virus: damage was most severe in the north, where soil conditions and rainfall are generally less favourable than in the south. In Zanzibar, cassava grown on fertile land was less affected by the disease than on less fertile soils. In many parts of Africa, cassava is usually grown with other crops including banana, sweet potato, cereals and legumes. Intercropping may improve overall land productivity and may decrease whitefly vector populations, whitefly activity and virus spread. However, intercropping is more likely to complement rather than to replace other more effective control measures. Studies in Uganda showed that in areas where many varieties of cassava were grown, losses were much less than by planting only one variety. Also disease incidence in a susceptible variety was lower when mixed with resistant varieties than when it was grown alone. Fargette, D. and Thresh, J.M. (1994). The Ecology of African Cassava Mosaic Geminivirus. In: Bakeman, J.P., Williamson, B. (Eds). Ecology of Plant Pathogens, CABI. Seif, A.A. (1981). Seasonal fluctuation of adult populations of the whitefly, Bemisia tabaci, on cassava. Insect Science Application 1 (4): 363-364. Seif, A.A. (1982). Effect of cassava mosaic virus on yield of cassava. Plant Disease Reporter 66 (8): 661-662. Seif, A.A. (1989). Epidemiology of African cassava mosaic virus in Kenya. East African Agricultural and Forestry Journal 54 (4): 215-221. Seif, A.A. (1979). Epidemiology of cassava mosaic disease in Coast Province of Kenya. Msc. Thesis. University of Nairobi, Kenya. Thresh, J.M. and Cooter, R.J. (2005). Strategies for controlling cassava mosaic virus disease in Africa. Review article. Plant pathology 54: 587-614.